The United States and many other heavily populated countries face a growing threat of severe and prolonged drought in coming decades, according to results of a new study by National Center for Atmospheric Research (NCAR) scientist Aiguo Dai. The detailed analysis concludes that warming temperatures associated with climate change will likely create increasingly dry conditions across much of the globe in the next 30 years. The drought may reach a scale in some regions by the end of the century that has rarely, if ever, been observed in modern times. 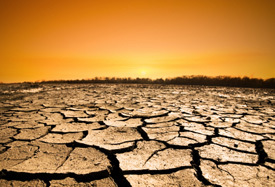 Using an ensemble of 22 computer climate models and a comprehensive index of drought conditions, as well as analyses of previously published studies, the paper reports that by the 2030s, dryness is likely to increase substantially across most of the Western Hemisphere, along with large parts of Eurasia, Africa, and Australia. By later this century, many of the world’s most densely populated regions will be threatened with severe drought conditions. Dai cautioned that the findings are based on the best current projections of greenhouse gas emissions. What happens in coming decades will depend on many factors, including actual future emissions of greenhouse gases as well as natural climate cycles such as El Niño. The new findings appear this week as part of a longer review article in Wiley Interdisciplinary Reviews: Climate Change. The study was supported by the National Science Foundation (NSF), NCAR’s sponsor. “This research does an excellent job of placing future warming-induced drought in the context of the historical drought record,” says Eric DeWeaver, program director in NSF’s Division of Atmospheric and Geospace Sciences, which funds NCAR. While regional climate projections are less certain than those for the globe as a whole, Dai’s study indicates that most of the western two-thirds of the United States will be significantly drier by the 2030s. Large parts of the nation may face an increasing risk of extreme drought during the century. The study also finds that drought risk can be expected to decrease this century across much of Northern Europe, Russia, Canada, and Alaska, as well as some areas in the Southern Hemisphere. However, the globe’s land areas should be drier overall. “The increased wetness over the northern, sparsely populated high latitudes can’t match the drying over the more densely populated temperate and tropical areas,” Dai says. Previous climate studies have indicated that global warming will probably alter precipitation patterns as the subtropics expand. The 2007 assessment by the Intergovernmental Panel on Climate Change (IPCC) concluded that subtropical areas will likely have precipitation declines, with high-latitude areas getting more precipitation. In addition, previous studies by Dai have indicated that climate change may already be having a drying effect on parts of the world. He and colleagues found that the percentage of Earth’s land area stricken by serious drought more than doubled from the 1970s to the early 2000s. Last year, he headed up a research team that found that some of the world’s major rivers are losing water. In his new study, Dai turned from rain and snow amounts to drought itself, and posed a basic question: how will climate change affect future droughts? If rainfall runs short by a given amount, it may or may not produce drought conditions, depending on how warm it is, how quickly the moisture evaporates, and other factors. Droughts are complex events that can be associated with significantly reduced precipitation, dry soils that fail to sustain crops, and reduced levels in reservoirs and other bodies of water that can imperil drinking supplies. A common measure called the Palmer Drought Severity Index classifies the strength of a drought by tracking precipitation and evaporation over time and comparing them to the usual variability one would expect at a given location. Dai turned to results from the 22 computer models used by the IPCC in its 2007 report to gather projections about temperature, precipitation, humidity, wind speed, and Earth’s radiative balance, based on current projections of greenhouse gas emissions. He then fed the information into the Palmer model to calculate the PDSI index. A reading of +0.5 to -0.5 on the index indicates normal conditions, while a reading at or below -4 indicates extreme drought. The index ranges from +10 to -10 for current climate conditions, although readings below -6 are exceedingly rare, even for small areas. By the 2030s, the results indicated that some regions in the United States and overseas could experience particularly severe conditions, with readings potentially dropping to -4 to -6 in much of the central and western United States as well as several regions overseas, and -8 or lower in parts of the Mediterranean. By the end of the century, many populated areas, including parts of the United States, could face readings in the range of -8 to -10, and much of the Mediterranean could fall to -15 to -20. Such readings would be almost unprecedented. Dai cautions that global climate models remain inconsistent in capturing precipitation changes and other atmospheric factors, especially at the regional scale. However, the 2007 IPCC models were in stronger agreement on high- and low-latitude precipitation than those used in previous reports, says Dai. There are also uncertainties in how well the Palmer index captures the range of conditions that future climate may produce. The index could be overestimating drought intensity in the more extreme cases, says Dai. On the other hand, the index may be underestimating the loss of soil moisture should rain and snow fall in shorter, heavier bursts and run off more quickly. Such precipitation trends have already been diagnosed in the United States and several other areas over recent years, says Dai. “The fact that the current drought index may not work for the 21st century climate is itself a troubling sign,” Dai says.